Although not as well known internationally as Royal Melbourne, Kingston Heath or Victoria, nearby Woodlands Golf Club is one of the great charms of the Sandbelt courses. It was completed in 1919 on open woodlands that had been used for grazing. The land was part of the estate of a Count Fonceca, a French nobleman, known as the “Mad Count” for his eccentric behaviour. Although laid out on the same sand based soil as its peers, the atmosphere is distinctly different at Woodlands. The clubhouse is more comfortable than monumental, its design based on an extension of the classic Australian bungalow with overhanging eaves. The bent grass greens are smaller than most on the Sandbelt and prove to be most elusive targets on a bad day. Course modifications have toughened the test and this is not a golf course where the golfer is invited to slash away from the tee. Patience rather than power hitting will be rewarded. The clubhouse sits at the southern extremity of the property and the first nine works its way through native bush in a general counter-clockwise direction, returning to the clubhouse by the 9th. The back nine then describes a general clockwise rotation commencing with the 10th. Woodlands even gets omitted from some commentators’ accounts of the Sandbelt. This is unjustified. The course offers a subtle test of golf in beautiful conditions. Woodlands is a beautiful tree lined course that doesn’t attract as much attention or fanfare as the rest of the courses in Melbourne’s Sandbelt despite having the same trademark bunkering and interesting greens that its neighbors are famous for. The knock on Woodlands is generally that it is too short and it does have several short par 4’s however in my opinion these holes are some of the best on the course and all of the shorter holes have devilish greens that are notoriously hard to hold unless approaching from the correct angle. I found the front nine to be better than the back it starts with a grand sweeping dogleg left par 4 from the top of the hill near the clubhouse and continues with a great variety of different holes intelligently routed across gently undulating terrain. The back nine is a bit flatter in places but maintains the interest in all the green sites many of which look like a bunker has taken a bite out of the green. As is the case with most of the Sandbelt courses they have a 19th hole that was in play the day I played and they have done a good job with this par 3 it fits in well with the rest of the course. Some say that Woodlands is a short course and at 6111 metres it is short in overall length by today’s standards against a par of 72. When you consider however that three of the par 4’s, are 300 metres or less in length, you appreciate that the other fifteen holes are plenty long enough. Rather than being required to drive the ball over 250 metres this is a golf course demanding precise iron play to small greens if one is to score well. Not only are the greens small, but they are for the most part slightly raised above their surrounds, meaning a small miss can mean one is left with a 20 metre shot or more back toward the green. The green surrounds are close mown allowing one to either chip or putt, but a great short game is required to make many up and downs from a missed green. Lastly, if you are going to miss the greens, generally miss them short for preference. Definitely don’t go over the back! 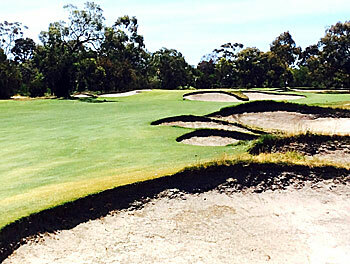 Woodlands plays over gently undulating terrain, common to many of Melbourne’s Sandbelt courses. Whilst there are no dramatic elevation changes, several holes (2nd, 4th, 9th, 10th (if you are a long hitter) and the 18th all have fairway landing areas obscured from the tee by the gentle rise and fall of the land and so prevent the golfers from seeing their ball finish. On offer at Woodlands are 5 doglegs (of varying severity) and 9 (relatively) straight holes. Par 3’s, of 168, 197, 139 and 154 metres . Par 4’s: the aforementioned three under 300 metres, another two under 350 metres and three over 400 metres . Par 5’s: two at 480 metres or less and two in excess of 510 metres. If Woodlands offers anything, it is a great variety of holes. Bring all your clubs and all your shots. Adding to the variety is the fact that hardly any of the holes run truly parallel to each other. Like most other things at Woodlands the alignment changes are subtle, 15 degrees here 30 degrees there, just enough to confuse the inattentive golfer. Only 2 of each of the par 3’s and 5’s play in anything like the same direction, which means the wind from any quarter poses a challenge. I won’t take the reader through a hole by hole description of the course, you can take a look at that on the club’s website, but I would like to highlight a couple of personal favourites. Already mentioned are the three short par 4’s. I fell so in love with this collection of holes 30 years ago that I joined the club! The 3rd at 300 metres has a dogleg right at the 200 metre mark. Played conventionally an accurate drive to the corner leaves a short iron in to a green perched some 2 metres above the fairway. This is one of the hardest greens to hold on the course so your approach needs to be crisp as well as precise or you will be playing your 3rd from deep bunkers left or right or a deep gully at the back. Not as deep as Royal Dornoch’s 2nd but still a challenge to get up and down. The long hitters often take on the corner aiming to leave a delicate flop shot second to the green or taking their chances from the greenside bunkers. Whilst the distance from tee to green across the dogleg is not beyond some it would be impossible for anyone to hit and hold the green from the tee. Immediately follows the even shorter 251 metre 4th. With a stroke index of 18 it is clearly the easiest hole on the course, but even without a single greenside bunker, it is just as easy to take a 6 here as a birdie 3 if you get out of position. If you can’t get the ball on the green in one, the next best place to leave it is short and right of fairway centre. This is because the green is somewhat triangular in shape with the apex at the front and with the right half of the green sloping just enough left to right to carry most balls off the green and down about a 1.5 metre slope. The 341 metre 7th is widely regarded as the best of the par 4’s. The fairway runs out at about 215 metres with a dense wood of trees and then more or less shifts 30 metres to the left before continuing on to the slightly elevated green guarded front , the entire left side and right rear by bunkers. There is a slight opening at the front right that one might run the ball up through if you have had to bail out to this area after an errant or not long enough drive. A perfectly shaped right to left drive following the dogleg in the fairway can leave a short iron to the green, but it needs to be perfect, otherwise look for the bail out short right of the green. The 168 metre 5th and 154 metre 17th are as good as any of the par 3’s in Melbourne’s sandbelt. One playing east /west and the other north/south are both generally made more difficult by being “hurt” by the prevailing south east wind. Both are heavily bunkered and relatively narrow greens. Best be straight or a 4 is likely the best you will do. Of the par 5’s, Tom Doak rates the 511 metre 15th hole amongst the best flat par 5’s in the world. Many in the club rate the 6th hole also at 511 metres as its equal. The fairway describes a gentle “S” shape with the drive required to be shaped right to left but with the fall of the land fighting against it and falling left to right. The second half of the fairway is guarded by wickedly rough tufted mounds about 120 metres short of the green. You can go round the left of them but then you have compromised the optimum line to the flag. As a consequence, unless you have got a “bomb” away off the tee you are just as well laying up short of the rough. Being in the suburbs of a large capital city, Woodlands like all its neighbouring Sandbelt courses is somewhat impacted by the urbanisation of its surrounds. There are no houses on Woodlands boundary fences, but three sides of the property are bordered by roads. One is simply a sidestreet but the other two are quite busy. Only the 2nd and 18th holes run their full length along these boundaries. Another three tees and one green are on these boundary fences but clever screening blocks out the sights if not the sounds of traffic. Away from these fences however you are in a beautiful Australian native bushland setting. Featuring heavily are Coastal Manna Gums and River Redgums, both indigenous to the area along with an assortment of other eucalypts. The club has been attentive over the last 10 years or so in removing non indigenous species and re-establishing native trees and small plants. This has encouraged back native fauna as well. The club motto of “Naturally Inviting” speaks to the nature of the course and to the welcome you will receive from staff and members alike. Woodlands is the most unique course on the Sandbelt. The property the course is laid out on is square in shape and affords holes that play in every direction of the compass. It has an attraactive variety of holes with 3 Par 4's 300 m or less together with 3 Par 4's longer than 400m. It's small, fast and firm greens reward accurate shots. Woodlands is an unforgettable golfing experience.